Several years ago, in a quiet restaurant in Hamburg, Germany, my husband Stephen and I met with AnneClaire Loogman, a dedicated mother whose love of children extended beyond her own family. Over dinner, she told us of her desire to develop a children's book based on the Spiral Sweep, an energy exercise I had presented to thousands of people all over the world. We all agreed and the project began. AnneClaire developed the idea to use the creative image of a golden dolphin and created the first elemental story line. We then invited Victoria Althoff to fully develop the story using her skills as an award winning children's book writer. Victoria went to work and did a wonderful job to evolve the story so children of all ages could understand and do the energy exercise. The final version of the story was edited just a little bit more by two mothers, myself and our oldest daughter Shana. Stephen also contributed as a father. ELan, Shana's husband and father of Ahdivah, carefully oversaw and coordinated each step of the project. The image of Will is inspired by our grandson Makai, son of our youngest daughter, Krista. The illustrator, Michael Graham put his heart and talent to work by creating the beautiful images that bring the story and energy exercise to life. Each one of us brought our hearts to this project. To be sure, the energy of nurturing love is the foundation of this story! 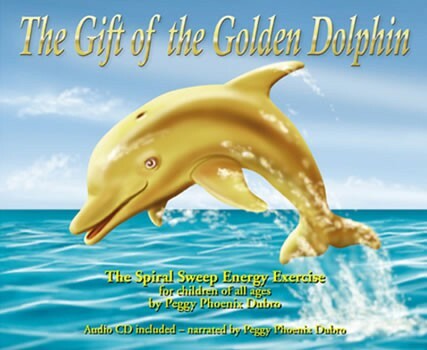 In this story of the Little Golden Dolphin, your child will learn the Spiral Sweep, an energy meditation/exercise that will teach them to be more aware of their own energy. Your child will learn that both their body and their mind are important parts of their spiritual evolution. The Spiral Sweep exercise creates an energetic posture of inner confidence and peace and it just feels really good! It is my intent that you and your child will enjoy practicing this exercise together and explore what it means to accelerate your own spiritual evolution. Are we at a moment in our human history when and where it is possible to consciously develop ourselves into a new kind of humanity? For the future of our children, I believe this is true.